The Don Mills and Eglinton neighbourhood will be seeing some major developments headed its way. The area will be booming with residences among other expansions in response to the upcoming Eglinton Crosstown LRT, soon to be line 5 of Toronto’s subway system. Specifically a community of four towers are being built in the neighbourhood, adding to its rapid urbanization. 770 Don Mills Road is the second and final part of a two-part development by Build Toronto. The site will stand at the southwest corner of Don Mills Road and Eglinton Avenue East. 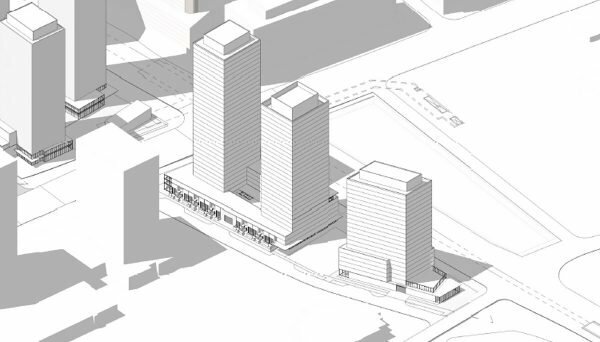 The project’s building C and D will occupy the East side of the site, while the sister buildings -- buildings A and B -- will sit at its West Site at 805 Don Mills. It will be in investors best interest to pay close attention to this upcoming community in a neighbourhood currently booming thanks to the construction of the impending transit expansion. The Eglinton Crosstown LRT marks Toronto’s largest extension in recent history. This ambitious development will draw a lot of attention and bustle to the Eglinton neighbourhood. The project’s buildings C and D will stand at the western and eastern ends of its 5.5 acre site, and will be divided by a mid-block public park. The buildings will together span a total gross floor area of 693,153 square feet. Parking for both buildings will be available in a consolidated three-level below grade parking garage, offering 540 individual spaces. Each building will have driveways accessible off the public road. Building C will front onto Don Mills, along the frontage of Eglinton Avenue East. 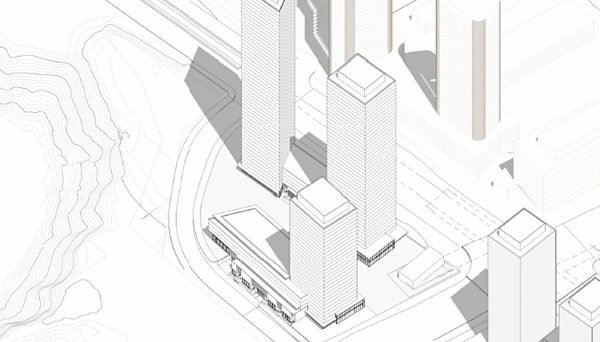 It will include an Eastern and Western tower, the two connected by a podium standing 3 to 6 storeys. The towers will respectively stand 28 storeys at 85.5 meters, and 34 storeys at 103.5 metres. Investors will be intrigued by the connective podium which will boast retail space fronting Eglinton Avenue East. Retail space will also available on the second level. In addition to the ground floor retail spaces, townhouse style units will also be fronting the street level. The podium will contain soley residential use on and above its third level. Building D will front Eglinton Avenue East, Ferrand Drive and Public Street C, located on the site’s eastern side. The tower will stand 67.5 metres at 22-storeys, and will also feature a 6-storey podium. In total with buildings A and B, the community will be home to a whopping 2,377 units. The units will be balanced as follows, 15% studio, 50% one-bedroom, 20% two-bedroom and 15% three-bedroom. Community space has been proposed at ground level in the building’s northwest corner, with more available on the north side of the second level, and units on the south side. The development will specifically focus on pedestrian walkways and communal areas to connect the community, and connect pedestrians to the upcoming subway station. Investors interest will be piqued by the locations’ prime location, steps away from the Eglinton Crosstown’s impending Science Centre Station. The location also boasts a walk score of 67 out of 100, and transit score of 78 out of 100. With a bike score of 87 out of 100, cyclists will also be able to make the most of the neighbourhood. The neighbourhood is attractive to all lifestyles, from students with roomates to business professionals to young families. Being steps away from the subway really opens the opportunity for a variety of residents, all with the daily goal to get from point A to point B. Students will find themselves close to the upcoming Eglinton line, which will make travelling to the city’s major campuses that much easier. Whether you are trying to get to Ryerson University, University of Toronto, OCAD or York University, being on the subway line is always key for students navigating early and late classes. Business professionals will also find it seamless to travel to the city’s business hubs not limited to the Entertainment District and Financial District. The location of the development is ideal for students and professionals wanting convenient travel into the city, while living in the quieter but still central uptown areas. Although the nearby transit makes it easy to travel into the city for a day adventure or dinner out, with the upscale Shops at Don Mills around the corner, residents need not go far for luxury shopping and upscale food experiences. With brands like Aritzia, Mendocino and Michael Kors in the outside shopping centre in addition to fantastic restaurants like Glow, Joeys and Fabbrica, you need not go far for a weeknight dinner or weekend day date. Investors will want to keep an eye on the central neighbourhood -- with the LRT and rapid growth on its way, there has never been a better time to invest in the Eglinton area. 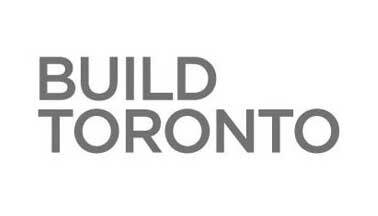 Build Toronto is a real-estate corporation established by The City Of Toronto. Committed to the Toronto Urban Design Awards back in 2009 as a Gold sponsor, they later launched as the City of Toronto’s independent real estate and development corporation in May of 2010. They were created ultimately to make the most of Toronto’s underused and surplus real estate assets by redeveloping them to meet their full potential.